Pyridoxine hydrochloride is water-soluble B vitamin widely used for the prevention and treatment of vitamin B6 deficiency and other several diseases. The aim of this study was to explore the effect of The Trivedi Effect® - Energy of Consciousness Healing Treatment on the physicochemical and thermal properties of pyridoxine hydrochloride using PXRD, PSA, DSC, and TGA/DTG analysis. Pyridoxine hydrochloride was divided into two parts, one part of pyridoxine hydrochloride was considered as control (no Biofield Treatment was provided), while second part received The Trivedi Effect® - Biofield Energy Healing Treatment remotely by a renowned Biofield Energy Healer, Alice Branton. The PXRD analysis exhibited that the relative intensities and crystallite sizes of the most characteristic diffraction peaks in the Alice’s treated pyridoxine hydrochloride were significantly decreased from 1.59% to 44.47% and 6.31% to 28.28%, respectively compared with the control sample. Overall, the average crystallite size of the treated sample was significantly reduced by 5.55% compared with the control sample. The particle size values at d10, d50, d90, and D(4, 3) (average mass-volume diameter) in Alice’s treated sample were significantly reduced by 13.87%, 9.95%, 7.87%, and 6.59%, respectively compared to the control sample. The specific surface area of treated sample was significantly increased by 13.67% compared to the control sample. The DSC analysis revealed that the melting point of the treated sample was lower by 0.20% with a significant reduction of the latent heat of fusion by 24.52% compared with the control sample. The TGA analysis revealed that the total weight loss in the treated sample was increased by 1.76% compared with the control sample. The DTG analysis indicated that the maximum thermal degradation temperature of the treated sample was reduced by 0.88% compared to the control sample. Overall, the thermal analysis indicated that the thermal stability of the treated pyridoxine hydrochloride was declined compared to the control sample. Thus, The Trivedi Effect® might lead to the production of a polymorphic form of pyridoxine hydrochloride which would be more soluble, absorbable, have a higher dissolution rate and be more bioavailable compared with the untreated sample. The Biofield Energy Treated pyridoxine hydrochloride would be beneficial in the design of better nutraceutical and pharmaceutical formulations which might provide better therapeutic responses against vitamin B6 deficiency, sideroblastic anemia, cardiovascular disease, diabetes, Alzheimer’s disease, pyridoxine-dependency seizures, metabolic disorders, pulmonary tuberculosis, hyperhomocysteinemia, cancer, anxiety, asthma, depression, dysmenorrhea, etc. Pyridoxine or Vitamin B6 is a water-soluble B vitamin which usually offers cofactors or prosthetic groups to different enzymatic reactions. Pyridoxine plays an important role in the metabolism of proteins, lipids, and carbohydrates. Besides, pyridoxine has the significant role in the function of the nervous, immune, red blood cell, and endocrine systems. It also assists to maintain the normal blood glucose level [1, 2]. Pyridoxine (alcohol form) is usually interconverted into pyridoxal (aldehyde form) and pyridoxamine (amine form). Pyridoxine, pyridoxamine, and their phosphorylated forms are usually major forms of vitamin B6 in plant food, while pyridoxal and pyridoxal-5ꞌ-phosphate (PLP) are the main forms observed in animal foods. Pyridoxine hydrochloride is the hydrochloride salt form of vitamin B6 and converted into its active coenzymatic form pyridoxal-5ꞌ-phosphate (PLP) [1-4]. Pyridoxine hydrochloride is commonly used as vitamin supplement or as a component of multivitamin preparations for the prevention and treatment of pyridoxine deficiency, sideroblastic anaemia, cardiovascular disease, Alzheimer’s disease, pyridoxine-dependency seizures, metabolic disorders, pulmonary tuberculosis, hyperhomocysteinemia, cancer, anxiety, asthma, attention deficit hyperactivity disorder (ADHD), depression, dysmenorrhoea, post-partum lactation suppression, diabetes, McArdle’s disease, osteoporosis, etc. [1, 4-7]. Biofield Energy is stated as quantum energy matrix that surrounds the human body resulting from the continuous movement of the electrically charged particles (ions, cells, etc.) inside the body. Biofield Energy releases constantly electromagnetic waves in the form of bio-photons from the body. Healing practitioners have the ability to harness the energy from the “universal energy field” and can transmit into any living or nonliving object(s) around the earth. The process, where the objects receive the biofield energy and respond to it in a useful way is called as Biofield Energy Healing Treatment [8, 9]. Biofield Energy Healing therapy has been recognized as a Complementary and Alternative Medicine (CAM) health care approach by National Center of Complementary and Integrative Health (NCCIH) with other therapies, medicines and practices such as yoga, Qi Gong, Tai Chi, chiropractic/osteopathic manipulation, meditation, homeopathy, acupressure, acupuncture, healing touch, hypnotherapy, movement therapy, naturopathy, Ayurvedic medicine, traditional Chinese herbs and medicines, aromatherapy, Reiki, cranial sacral therapy, etc. [10, 11]. Biofield Energy Healing Treatment (The Trivedi Effect®) is drawing importance in several fields include material science , pharmaceuticals , nutraceuticals , organic compounds [15, 16], microbiology , agricultural , biotechnology , genetics , medical  due to its amazing ability for modification of the characteristic properties of the numerous non-living and living substances. Scientific literature extensively reported significant problems about the bioavailability of vitamin B6. The major problems were very limited extent intestinal absorption of B6 vitamers, large rate constant of elimination due to the non-binding properties of pyridoxine to the proteins of blood plasma, and instability of pyridoxine due to the complex formation between various food, drug, and cosmetic colours, packaged or canned food stored at elevated temperatures [1, 3, 4]. The Trivedi Effect®-Energy of Consciousness Healing Treatment significantly altered physicochemical properties such as crystalline structure, crystallite size, particle size, surface area, and thermal stability through introducing a polymorph of the pharmaceutical/nutraceutical compound. It was suggested that Biofield Energy Treated pharmaceutical/nutraceutical compounds could have more bioavailable and thermally stable compared with the untreated compounds [22-26]. The physicochemical and thermal properties etc. of a pharmaceutical solid compound play an important role in drug product performance i.e. bioavailability, therapeutic efficacy, and toxicity [27, 28]. The Energy of Consciousness Healing Treatment (The Trivedi Effect®) might modify the physicochemical and thermal properties through the possible intervention of neutrinos . Thus, it was aimed to explore the impact of The Trivedi Effect® - Energy of Consciousness Healing Treatment on the physicochemical and thermal properties of pyridoxine hydrochloride using powder X-ray diffraction (PXRD), particle size analysis (PSA), differential scanning calorimetry (DSC), and thermogravimetric analysis (TGA)/ Differential thermogravimetric analysis (DTG). Pyridoxine Hydrochloride was purchased from Tokyo Chemical Industry Co. Ltd., Japan. All other chemicals used during the experiments were of analytical grade available in India. The sample of Pyridoxine Hydrochloride was divided into two parts. One part of Pyridoxine Hydrochloride was considered as control (no Biofield Energy Treatment was provided). Consequently, the second part of Pyridoxine Hydrochloride was treated with The Trivedi Effect® - Energy of Consciousness Healing Treatment remotely under standard laboratory conditions for 3 minutes and known as The Trivedi Effect® or Biofield Energy Treated sample. This Biofield Energy Treatment was provided through the healer’s unique energy transmission process by the renowned Biofield Energy Healer, Alice Branton, USA to the test item. Further, the control group was treated with “sham” healer for comparison purpose. The sham healer did not have any knowledge about the Biofield Energy Treatment. After that, the Biofield Energy Treated and untreated samples were kept in sealed conditions and characterized using PXRD, PSA, DSC, and TGA techniques. The particle size analysis of pyridoxine hydrochloride was conducted on Malvern Mastersizer 3000, UK with a detection range between 0.01 µm to 3000 µm using wet method [22-24]. The sample unit (Hydro MV) was filled with a dispersant medium (Toulene) and operated the stirrer at 2500 rpm. Refractive index values for dispersant and samples were 0.0 and 1.47. The measurement was taken twice after reaching obscuration in between 10% and 20% and the average was taken of two measurements. Consequently, PSA analysis of pyridoxine hydrochloride was repeated for three times to obtain the average particle size distribution. d10 µm, d50 µm, d90 µm represent particle diameter corresponding to 10%, 50%, and 90% of the cumulative distribution. D(4, 3) represents the average mass-volume diameter, and SSA is the specific surface area (m2/Kg). The calculations were done by using software Mastersizer V3.50. Where, SControl and STreated are the surface area of the control and Biofield Energy Treated Pyridoxine Hydrochloride, respectively. Where, ∆HControl and ∆HTreated are the latent heat of fusion of the control and treated pyridoxine hydrochloride, respectively. Where, WControl and WTreated are the weight loss of the control and Biofield Energy Treated pyridoxine hydrochloride, respectively. Where, MControl and MTreated are the Tmax values of the control and Biofield Energy Treated pyridoxine hydrochloride, respectively. The PXRD diffractograms of the control and Biofield Energy Treated pyridoxine HCl (Figure 1) exhibited 9 sharp and intense peaks at Bragg’s angle (2θ) equal to 10.3°, 17.0°, 20.8°, 22.0°, 24.2°, 25.1°, 25.9°, 27.9°, and 30.0° (Table 1 ) indicating that both the samples were crystalline in nature. The PXRD diffractogram of the control and Biofield Energy Treated samples showed highest peak intensity (100%) at 2θ equal to 25.1° (Table 1, entry 6). Thereafter, the relative intensities of the PXRD peaks at 2θ equal to 10.3°, 17.0°, 20.8°, 22.0°, 24.2°, 25.9°, and 30.0° (Table 1, entry 1-5, 7, and 9) in the Biofield Energy Treated sample were significantly decreased from 1.59% to 44.47% compared to the control sample. Consequently, the relative intensity of the PXRD peaks at 2θ equal to 27.9° (Table 1, entry 8) in the Biofield Energy Treated sample was increased by 0.64% compared to the control sample. Figure 1. PXRD diffractograms of the control and Biofield Energy Treated Pyridoxine Hydrochloride. Table 1. PXRD data for the control and Biofield Energy Treated Pyridoxine Hydrochloride. 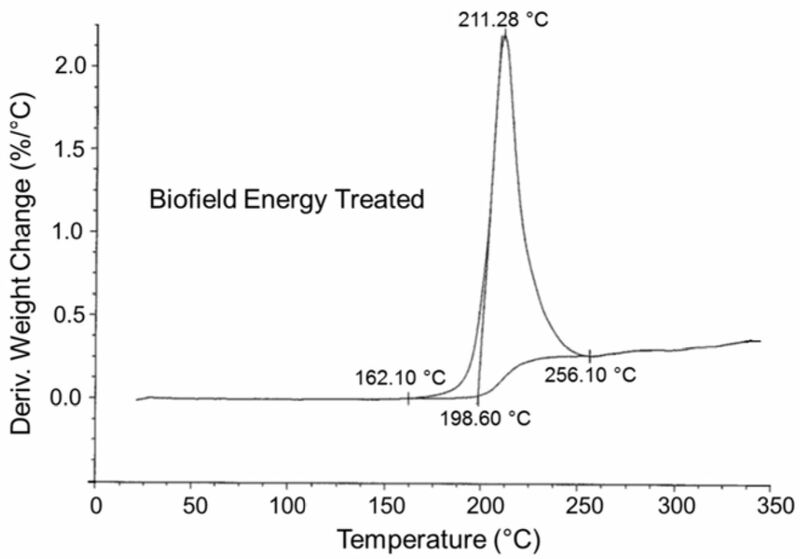 The crystallite sizes of the Biofield Energy Treated sample at 2θ equal to 10.3°, 22.0°, 27.9°, and 30.0° (Table 1, entry 1, 4, 8, and 9) were significantly decreased from 6.31% to 28.28% with respect to the control sample. Additionally, at position 2θ equal to 17.0° (Table 1, entry 2), the crystallite size of the Biofield Energy Treated sample was significantly increased by 33.36% compared with the control sample. Consequently, the crystallite sizes of the control and Biofield Energy Treated pyridoxine HCl at 2θ equal to 20.8°, 24.2°, 25.1°, and 25.9° (Table 1, entry 3, 5, 6, and 7) remained unaltered. Overall, the average crystallite size of the Biofield Energy Treated sample (38.86 nm) was significantly reduced by 5.55% compared with the control sample (36.70 nm). This result indicated that crystallinity of the Biofield Energy Treated pyridoxine hydrochloride was significantly reduced compared with the control sample. Scientific literature reported that Biofield Energy Treatment has the significant capability to produce a new polymorph by altering the crystal morphology of the pharmaceuticals and nutraceuticals through changing the relative intensities and crystallite size of the characteristic diffraction face [22-24, 31]. The significant variations in the crystallite size and relative intensities indicated the modification of the crystal morphology of the Biofield Energy Treated pyridoxine hydrochloride compared to the control sample. The Trivedi Effect® - Energy of Consciousness Healing Treatment probably led to produce a polymorphic form through the energy transferred into the pyridoxine hydrochloride. Zhao et al. reported that decreased intensity of characteristic diffraction peaks and reduced crystallinity increased the dissolution rate of an orally administered pharmaceutical powder . Thus, it can be anticipated that The Trivedi Effect® might offer better bioavailability of pyridoxine hydrochloride in its oral formulation. The particle size of both the control and Biofield Energy Treated pyridoxine hydrochloride was assessed and is shown in Table 2. Table 2. Particle size distribution of the control and Biofield Energy Treated Pyridoxine Hydrochloride. d10, d50, and d90: particle diameter corresponding to 10%, 50%, and 90% of the cumulative distribution; D(4, 3): the average mass-volume diameter; SSA: the specific surface area; *denotes the percentage change in the Particle size distribution of the Biofield Energy Treated sample with respect to the control sample. The particle size distribution of the control pyridoxine HCl was found at d10 = 10.89 µm, d50 = 32.56 µm, d90 = 111.40 µm, and D(4, 3) = 48.11 µm. 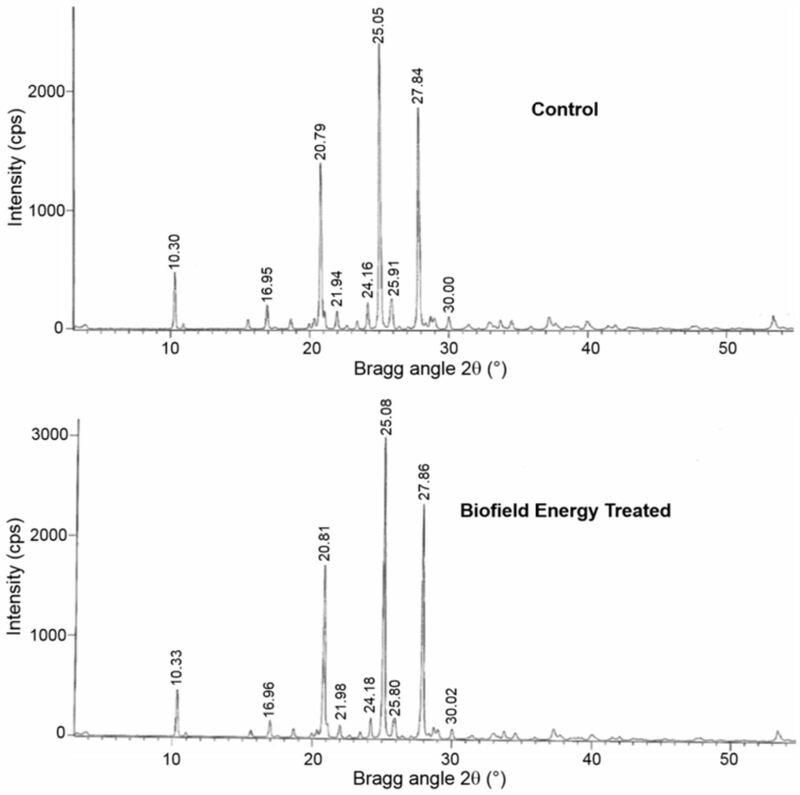 Subsequently, the particle size distribution of the Biofield Energy Treated sample was observed at d10 = 9.38 µm, d50 = 29.32 µm, d90 = 102.63 µm, and D(4, 3) = 44.94 µm. The particle size values at d10, d50, d90, and D(4, 3) in Alice’s Biofield Energy Treated sample were significantly decreased by 13.87%, 9.95%, 7.87%, and 6.59%, respectively compared to the control sample. The specific surface area of Biofield Energy Treated pyridoxine hydrochloride (276.00 m2/Kg) was significantly increased by 13.67% compared with the control sample (242.80 m2/Kg). It is assumed that The Trivedi Effect® might act as an external force like ball milling for reducing the particle size of pyridoxine HCl. The literature reported that a pharmaceutical solid compound having reduced particle size and crystallinity with the increased surface area possesses improved solubility dissolution rate, and finally bioavailability [32-34]. Thus, it is anticipated that The Trivedi Effect® - Energy of Consciousness Healing Treated pyridoxine hydrochloride might offer better bioavailability than the untreated sample. DSC has been found as a simple technique to characterize the thermal behaviors like melting and crystallization behaviors . 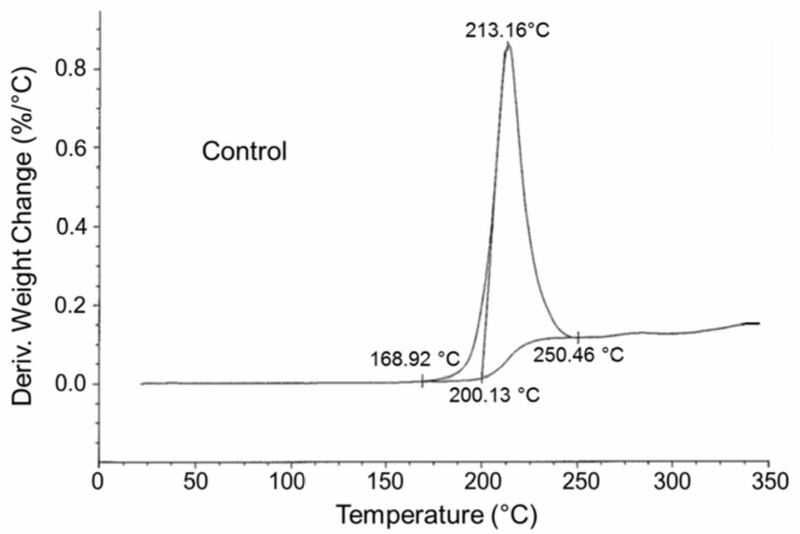 The DSC thermogram of the control pyridoxine hydrochloride (Figure 2) showed only a sharp endothermic peak at 214.14°C which is the melting point of pyridoxine hydrochloride. The melting point of the Biofield Energy Treated sample (213.82°C) was slightly reduced by 0.20% compared as the control sample (Table 3). Table 3. DSC data for both control and Biofield Energy Treated samples of Pyridoxine Hydrochloride. The latent heat of fusion (∆H) of the Biofield Energy Treated pyridoxine hydrochloride was significantly decreased by 24.52% compared with the control sample (Table 3). The reduction in the latent heat of fusion can be attributed to the disrupted molecule chains and reduced the crystallization structure . Thus, it is assumed that Alice’s Biofield Energy treatment may be responsible for the disruption the molecular chains and crystallization structure of pyridoxine hydrochloride. The results suggested that the thermal stability of the Biofield Energy Treated sample was decreased compared with the control sample. Figure 2. DSC thermograms of the control and Biofield Energy Treated Pyridoxine Hydrochloride. Literature mentioned that pyridoxine hydrochloride was stable below 150°C [35, 36]. The TGA thermograms of the control and Biofield Energy Treated samples displayed two steps of thermal degradation (Figure 3). The percentage weight loss in Biofield Energy Treated pyridoxine hydrochloride was increased by 3.58% in the 1st step of degradation, while the percentage weight loss in the 2nd step degradation was reduced by 1.23% compared with the control sample (Table 4). The total weight loss in the Biofield Energy Treated pyridoxine hydrochloride was increased by 1.76% compared to the control sample (Table 4). Table 4. TGA/DTG data of the control and Biofield Energy Treated samples of Pyridoxine Hydrochloride. *denotes the percentage change of the Biofield Energy Treated sample with respect to the control sample, Tmax = the temperature at which maximum weight loss takes place in TG or peak temperature in DTA. Figure 3. TGA thermograms of the control and Biofield Energy Treated Pyridoxine Hydrochloride. The DTG thermograms of the control and Biofield Energy Treated samples (Figure 4) exhibited only one peak. 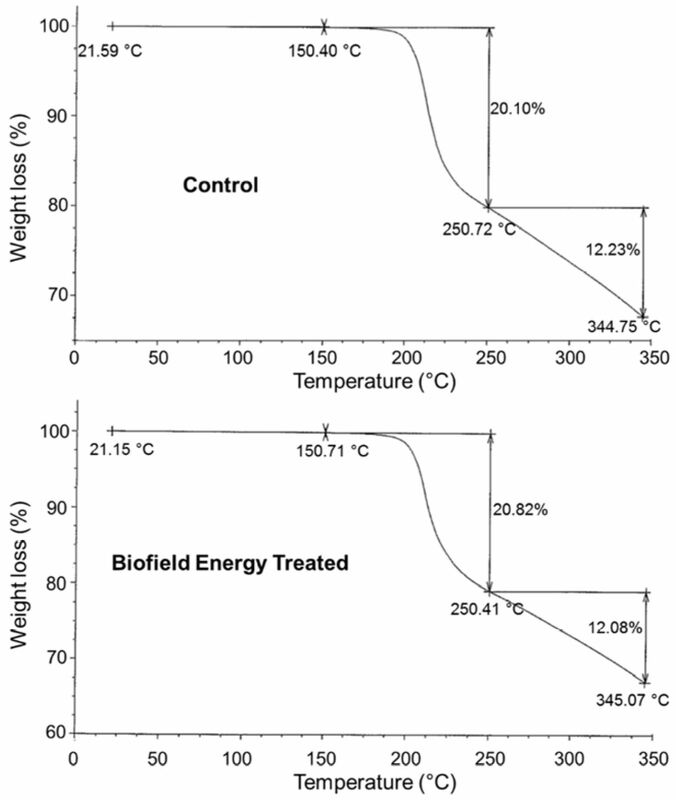 The control sample was thermally stable up to 213.16°C, while Biofield Energy Treated sample was stable up to 211.28°C. 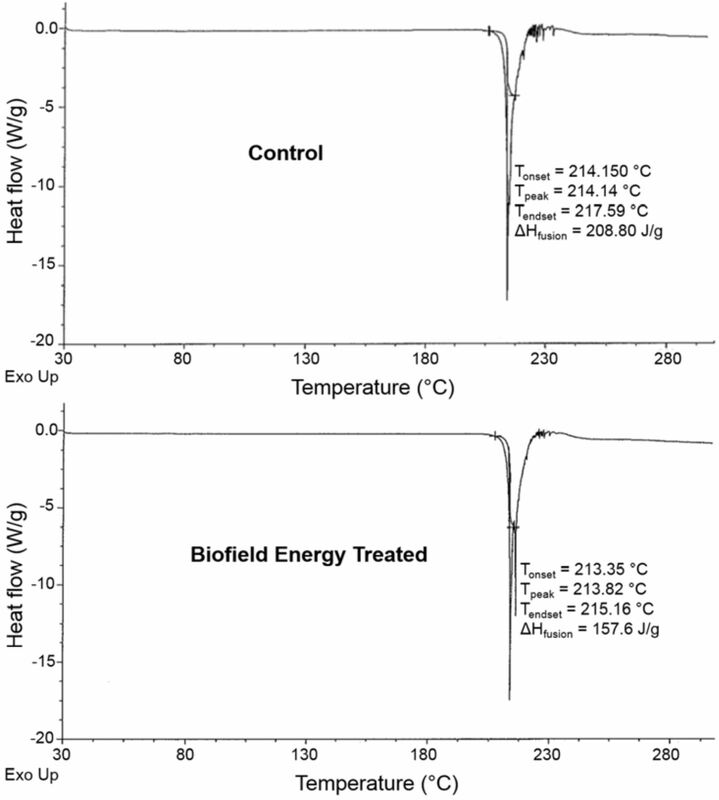 The Tmax of the Biofield Energy Treated sample was lower by 0.88% than the control sample as shown in Table 4. Overall, TGA/DTG revealed that the thermal stability of the Biofield Energy Treated pyridoxine hydrochloride was reduced compared with the control sample. Figure 4. DTG thermograms of the control and Biofield Energy Treated Pyridoxine Hydrochloride. The Trivedi Effect® - Energy of Consciousness Healing Treatment displayed significant effects on the relative intensities and crystallite size of the most characteristics diffraction peaks, particle size, surface area, and thermal stability of pyridoxine hydrochloride or vitamin B6. The relative intensities of the most characteristic diffraction peaks in the Alice’s Biofield Energy Treated pyridoxine hydrochloride were significantly decreased from 1.59% to 44.47%, only one peak’s intensity was increased by 0.64% compared with the control sample. The crystallite size of the most characteristic diffraction peak in the treated sample was reduced from 6.31% to 28.28%, while only one peak’s crystallite size was increased by 33.36% compared with the control sample. Overall, the average crystallite size of the treated sample was significantly decreased by 5.55% compared with the control sample. The particle size values at d10, d50, d90, and D(4, 3) in Biofield Energy Treated sample were significantly decreased by 13.87%, 9.95%, 7.87%, and 6.59%, respectively compared with the control sample. The specific surface area of the Biofield Energy Treated sample was significantly increased by 13.67% compared to the control sample. The DSC analysis showed that the melting point of the treated sample was decreased by 0.20% with a significant reduction of the latent heat of fusion by 24.52% compared to the control sample. The TGA analysis revealed that the total weight loss in the treated sample was increased by 1.76% compared with the control sample. The DTG analysis indicated that the Tmax of the treated sample was decreased by 0.88% compared with the control sample. Overall, the thermal analysis indicated that the thermal stability of the treated pyridoxine hydrochloride was decreased compared to the control sample. Thus, The Trivedi Effect® might lead to produce a polymorphic form of pyridoxine hydrochloride which would be more soluble, absorbable, have a higher dissolution rate and be more bioavailable compared with the untreated sample. The Biofield Energy Treated pyridoxine hydrochloride would be useful to design better nutraceutical and pharmaceutical formulations which might afford better therapeutic response against pyridoxine deficiency, hereditary sideroblastic anemia, premenstrual syndrome, cardiovascular disease, Alzheimer’s disease, pyridoxine-dependency seizures, metabolic disorders, pulmonary tuberculosis, hyperhomocysteinemia, cancer, anxiety, asthma, attention deficit hyperactivity disorder (ADHD), depression, dysmenorrhea, akathisia, angioplasty, birth outcomes, carpal tunnel syndrome, cognitive function, hyperkinetic cerebral dysfunction syndrome, hypertension, immune system function, lactation suppression, McArdle’s disease, osteoporosis, breast pain, pregnancy-induced nausea and vomiting, Tardive dyskinesia, febrile seizures, autism, stroke recurrence, etc. Dakshinamurti S, Dakshinamurti K (2007) Vitamin B6 in Handbook of Vitamins, 4th Edn., Zempleni J, Rucker RB, McCormick DB, Suttie JW, CRC Press, Taylor & Francis Group, Boca Raton, USA, pp. 315-360. Aboul-Enein HY, Loutfy MA (1984) Pyridoxine Hydrochloride in Analytical Profiles of Drug Substances, Florey K (Ed. ), Vol 13, Academic Press, Inc., Orlando, USA, pp. 448-478. Leklem JE (2001) Vitamin B6 in Handbook of Vitamins, 3rd Edn., Rucker RB, Suttie JW, McCormick DB, Machlin LJ, Marcel Dekker, Inc., New York, pp. 339-396. Qian B, Shen S, Zhang J, Jing P (2017) Effects of Vitamin B6 Deficiency on the Composition and Functional Potential of T Cell Populations. J Immunol Res 2017: 2197975. AlSaad D, Awaisu A, Elsalem S, Abdulrouf PV, Thomas B, AlHail M. Is pyridoxine effective and safe for post-partum lactation inhibition? A systematic review. J Clin Pharm Ther. 2017 Apr 19. doi: 10.1111/jcpt.12526. Trivedi MK, Branton A, Trivedi D, Nayak G, Plikerd WD, Surguy PL, Kock RJ, Piedad RB, Callas RP, Ansari SA, Barrett SL, Friedman S, Christie SL, Chen Liu S-M, Starling SE, Jones S, Allen SM, Wasmus SK, Benczik TA, Slade TC, Orban T, Vannes VL, Schlosser VM, Albino YSY, Sethi KK, Panda P, Jana S (2017) Evaluation of the physicochemical, spectral, thermal and behavioral properties of sodium selenate: influence of the energy of consciousness healing treatment. American Journal of Quantum Chemistry and Molecular Spectroscopy 2: 18-27. Trivedi MK, Branton A, Trivedi D, Nayak G, Lee AC, Hancharuk A, Sand CM, Schnitzer DJ, Thanasi R, Meagher EM, Pyka FA, Gerber GR, Stromsnas JC, Shapiro JM, Streicher LN, Hachfeld LM, Hornung MC, Rowe PM, Henderson SJ, Benson SM, Holmlund ST, Salters SP, Panda P, Jana S (2017) Evaluation of the impact of biofield energy healing treatment (The Trivedi Effect®) on the physicochemical, thermal, structural, and behavioral properties of magnesium gluconate. International Journal of Nutrition and Food Sciences. 6: 71-82. Juhasz M, Kitahara Y, Takahashi S, Fujii T (2012) Study of the Thermal Stability Properties of Pyridoxine Using Thermogravimetric Analysis. Analytical Letters 45: 1519-1525.